A dormant volcano—a supermassive black hole—lies at the heart of our galaxy. Fresh evidence suggests that it last erupted two million years ago. Astronomers have long suspected such an outburst occurred, but this is the first time they’ve been able to date it. The evidence comes from a lacy filament of gas, mostly hydrogen, called the Magellanic Stream. This trails behind our galaxy’s two small companion galaxies, the Large and Small Magellanic Clouds. “For twenty years we’ve seen this odd glow from the Magellanic Stream,” said Professor Joss Bland-Hawthorn, an ARC Federation Fellow at the University of Sydney, Australia, and a Fellow at the Australian Astronomical Observatory, who led a team studying this problem. “It’s been long suspected that our galactic center might have sporadically flared up in the past. 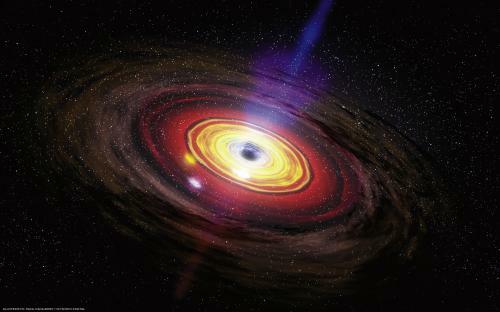 These observations are a highly suggestive ‘smoking gun’,” said Martin Rees, Astronomer Royal, who was one of the first people to suggest that black holes generate the power seen coming from quasars and galaxies with ‘active’ centers. The team gives its arguments in a paper accepted for publication in The Astrophysical Journal. Professor Bland-Hawthorn will speak about the work at the Galaxy Zoo meeting in Sydney, Australia, on 24 September…. The giant gas cloud heading for the black hole at the centre of our galaxy has begun its death spiral. The cloud, known as G2 is now being stretched out like a piece of spaghetti by the black hole’s extreme gravity. This gravitational field has caused the head of the cloud to accelerate around the black hole and to speed back towards us. Astronomers have been closely observing G2, hoping to catch it being ripped apart and eaten by the black hole. 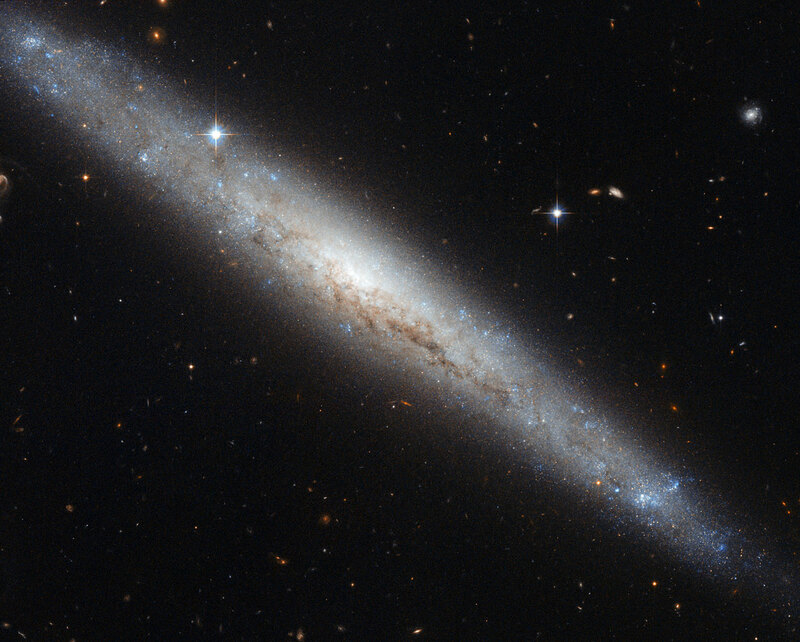 Details of the latest observations are outlined in the Astrophysical Journal [http://arxiv.org/abs/1306.1374]……. This image uses data identified by Luca Limatola in the Hubble’s Hidden Treasures image processing competition. 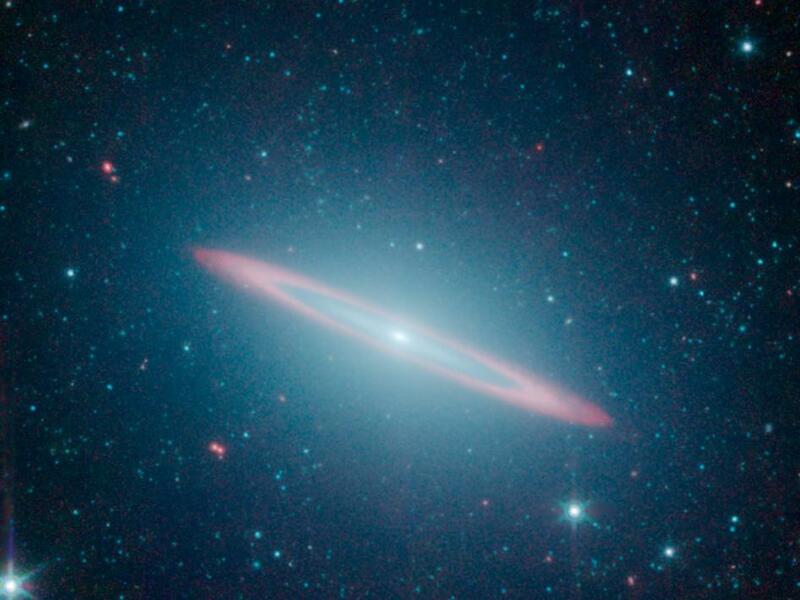 The infrared vision of NASA’s Spitzer Space Telescope has revealed that the Sombrero galaxy — named after its appearance in visible light to a wide-brimmed hat — is in fact two galaxies in one. It is a large elliptical galaxy (blue-green) with a thin disk galaxy (partly seen in red) embedded within. Previous visible-light images led astronomers to believe the Sombrero was simply a regular flat disk galaxy. Spitzer’s infrared view highlights the stars and dust. The starlight detected at 3.5 and 4.6 microns is represented in blue-green while the dust detected at 8.0 microns appears red. This image allowed astronomers to sample the full population of stars in the galaxy, in addition to its structure. The flat disk within the galaxy is made up of two portions. The inner disk is composed almost entirely of stars, with no dust. Beyond this is a slight gap, then an outer ring of intermingled dust and stars, seen here in red. The Milky Way gives the impression of a beautiful, calm field of stars. At the heart of all this is a supermassive black hole that sits, innocently, at the galactic centre. In reality, however, our galaxy is a maelstrom of havoc on a scale that is hard to comprehend. And now evidence is emerging that the galactic centre has recently been much more active. For a start, there is the dramatic recent discovery of two giant bubbles of gamma-ray emitting gas that extend some 20 kiloparsecs to the north and south of the galactic centre. Nobody is quite sure what generated the so-called Fermi Bubbles but they have more than a passing resemblance to the kind of jets emitted by active galactic nuclei. Then there is the strange level of star formation going on near our supermassive black hole. The huge gravity associated with this black hole ought to tear gas clouds apart and that should make star formation tricky. And yet, the galactic centre is home to three massive clouds in which tens of thousands of stars are currently being born. While we’re talking about stars, we ought to mention the distinct lack of older stars in the centre. That’s certainly fishy since there’s no shortage of them elsewhere in the galaxy. Finally, there is the unusual fluorescence coming from iron nuclei in a gas cloud close to our supermassive black hole. This is almost certainly an echo of gamma ray bombardment that must have occurred just a couple of hundred years ago. Clearly, the centre of our galaxy was once much more active, perhaps even in the time since the American War of Independence. Today, Meagan Lang at Vanderbilt University in Nashville and a few pals say they think they can explain all this activity. Their idea is that a small satellite galaxy recently smashed into the Milky Way, bringing with it stars, gas and a huge black hole some 10,000 times more massive than the Sun. Here’s what they say happened. 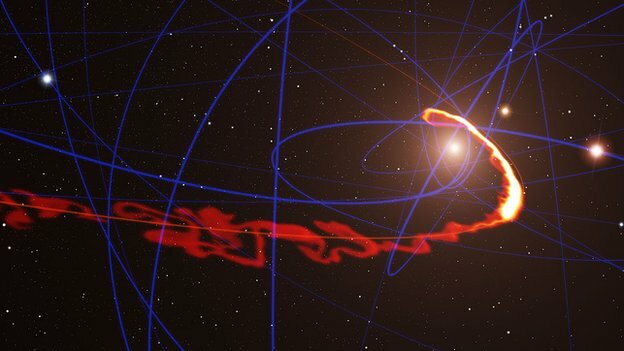 The new black hole spiralled into our own, but not before slinging away most of the older stars from the galactic centre. Much of the new dust was devoured by our own supermassive black hole, causing it to belch gamma ray-emitting jets into intergalactic space. The Fermi Bubbles are the remnants of these. The rest of the dust became a maelstrom of turbulence, perfect conditions for triggering the star formation we see today. According to Lang and pals, the collision must have begun when the universe was still young. But they conclude that the collision effectively ended when the new black hole eventually combined with our own, an event that probably happened in the very recent past, perhaps just 10 million years ago. That’s certainly an exciting idea, indeed one that has a touch of Hollywood about it. With any luck, it’ll generate some interesting debate, something that cosmologists are generally exceedingly good at. Ref: arxiv.org/abs/1107.2923: Can A Satellite Galaxy Merger Explain The Active Past Of The Galactic Center? We present a model of the Galactic Habitable Zone (GHZ), described in terms of the spatial and temporal dimensions of the Galaxy that may favour the development of complex life. 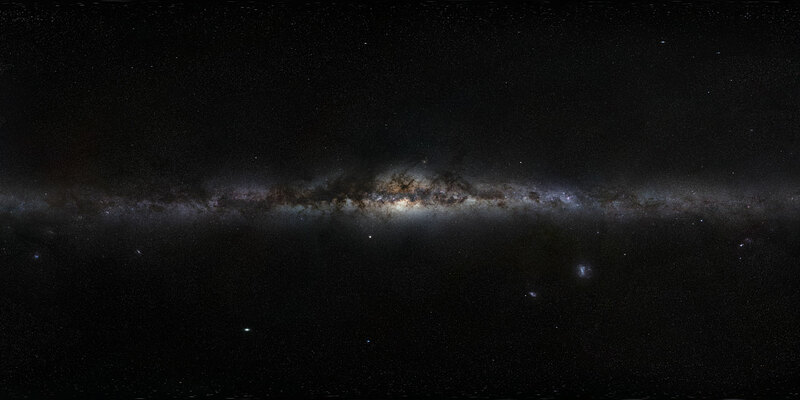 The Milky Way galaxy is modelled using a computational approach by populating stars and their planetary systems on an individual basis using Monte-Carlo methods. We begin with well-established properties of the disk of the Milky Way, such as the stellar number density distribution, the initial mass function, the star formation history, and the metallicity gradient as a function of radial position and time. We vary some of these properties, creating four models to test the sensitivity of our assumptions. To assess habitability on the Galactic scale, we model supernova rates, planet formation, and the time required for complex life to evolve. 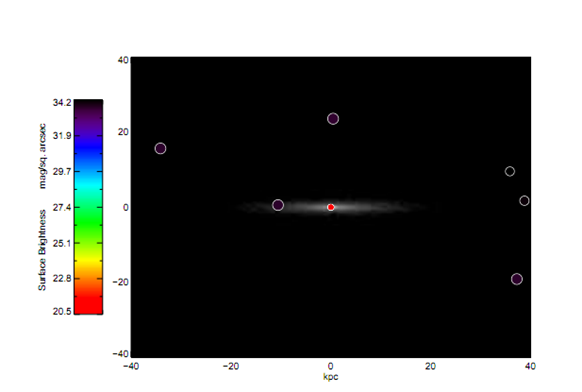 Our study improves on other literature on the GHZ by populating stars on an individual basis and by modelling SNII and SNIa sterilizations by selecting their progenitors from within this preexisting stellar population. Furthermore, we consider habitability on tidally locked and non-tidally locked planets separately, and study habitability as a function of height above and below the Galactic midplane. In the model that most accurately reproduces the properties of the Galaxy, the results indicate that an individual SNIa is ~5.6 \times more lethal than an individual SNII on average. In addition, we predict that ~1.2% of all stars host a planet that may have been capable of supporting complex life at some point in the history of the Galaxy. Of those stars with a habitable planet, ~75% of planets are predicted to be in a tidally locked configuration with their host star. The majority of these planets that may support complex life are found towards the inner Galaxy, distributed within, and significantly above and below, the Galactic midplane…..